I used to drink half and half in my coffee every morning. No sugar, just cream. It really made the perfect cup of coffee. And I am a huge coffee drinker. When even a little bit of half and half made me feel sick, I had a hard time handling it. At first I just dealt with the discomfort, but stomach cramps finally led me to try other products. Plain soy milk in coffee was just disgusting. Even Very Vanilla Soymilk didn’t really cut it for me. I tried Coconut Milk Creamer–totally gross. I didn’t want to do it, but for a long time I started using Coffeemate non-dairy creamer. That stuff is really terrible for you–it’s like drinking trans fat. I tried many different flavors that were tasty. My favorites were the sugar-free vanilla, which tasted like marshmallow to me, the peppermint mocha, and original, which was the closest taste to half and half that I could find. But they completely covered the taste of the coffee as well. That’s okay if you are drinking ground Foldgers, but not okay if you bought a new bag of fresh, whole bean Caribou Blend. What can I say? I love my coffee. I realized that when I ordered a soy mocha or soy latte at Starbucks it tasted amazing. So why didn’t my coffee taste amazing when I added vanilla soy milk? The answer was in the steaming. I don’t know why, but heated soy milk in coffee tastes ten times better than cold soy milk in coffee. Especially when that soy milk is very, very sweet. The sweeter the better. So after all of my experiments and attempts to find the perfect healthy replacement for half and half, I have finally found the answer. I wanted to pass along my knowledge, which is actually a small recipe. 1. 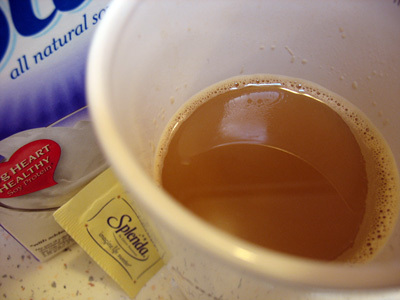 Mix the soymilk and sugar (I use Splenda or Truvia) in a microwave safe mug and heat for 30 seconds. 2. Pour in the fresh, hot gourmet coffee and find your happy place. You can also substitute vanilla soy milk with soy vanilla ice cream–it’s a great cream alternative to your coffee and helps it cool down as well.